Curves are used to plot (x, y) data, with optional error bars on both axes. A later example shows how to display error bars on the points. The default appearance of curves is to display each point as a cross, connected by a solid line. The symbol style and line style can be changed, but in this plot we just override the default symbol size and line color when the curve is created. 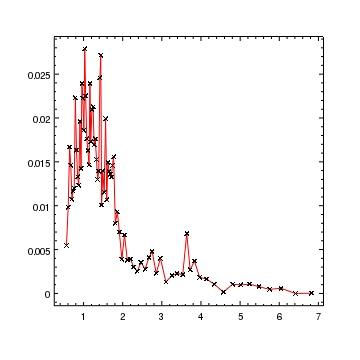 In this plot we hide the line connecting the points by setting its style to noline and change the symbol to diamond. 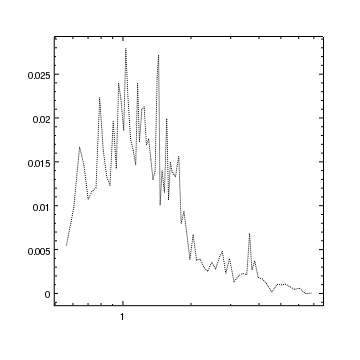 After the plot has been created the Y axis is changed to use a logarithmic scale using the log_scale command. Curves can also be displayed as a set of connected lines with no symbols, as in this example. The line can be drawn in one of a number of styles; this example uses the dotted version. This example shows some of the flexibility of curves by changing how the symbol, line, and error bars are drawn. It also illustrates that curves can be created from arrays, not just read in from data files. The first set of lines create a set of (x,y) points with asymmetric error bars. 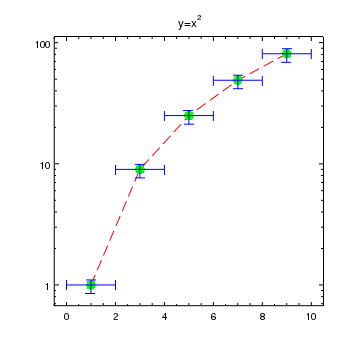 For the purposes of this example plot simple numerical relations are used. Error values are indicated by the third argument being a list of arrays, where the number of elements of this list determine how the arrays are used, as given in the table below. All error values are relative and should be positive. A ChipsCurve object is used to change the curve attributes; in this case the choices are made to highlight some of the control that is provided by ChIPS. The set_curve command is used to apply these new values. 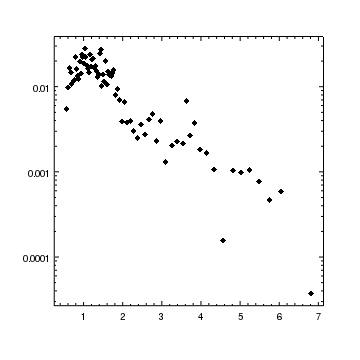 Note that the Y errors are displayed correctly even when the axis has been changed to use a logarithmic scale.